When I read the blurbs on some books, I sometimes find myself wondering whether I read the same book as the reviewer did. “Quirky, well-observed, genuinely funny” wrote Marele Day about this book. The first two I concur with, but I found very little humour in the book. It seemed achingly sad to me. George and Matthew Harrison are two twenty-something brothers sharing a house. Both are wounded, damaged young men. The narrator, George is not exactly the sharpest knife in the drawer, and he works amiably enough in a dead-end job at a bowling alley washing dishes and doing other odd and demeaning jobs around the place. His boss takes advantage of his acquiescence, placing the reader in the uncomfortable place of watching injustice at a distance, unable to intervene. I sorrowed (because I was reading as a mother of young adult children no doubt) at the obsessiveness and desperation with which he grapples with his break-up with a girlfriend who, frankly, seems much brighter than he is, and at the rather brittle bravado with which he props up his self-esteem. His older brother Matthew is recovering after a car accident that killed his girlfriend. He’s not eating, he’s sleeping too much. He’s not doing well. The boys’ father had committed suicide; their mother has her own strangeness. So, in all, not a lot to laugh about here. The triumph of this book, I think, is George’s voice. There’s a danger in having such a flawed, unconscious narrator in such a look-away situation, balancing the reader’s discomfort and even embarrassment for the teller, with enough sympathy to keep reading, almost with a sense of concern for him. The book is written in the first person present tense, which I always find a rather oppressive and intrusive style, but I think that it works well here. There are no chapter divisions, but the book is written in three parts. It starts with a short prologue. The narrative is broken up by dream sequences, without punctuation, unevenly spaced and told in disconnected snatches, as dreams often are. There’s some beautiful, plaintive writing here that balances the rather plodding, impoverished real-life of daylight. I feel a bit embarrassed to confess this, but I misread the dream sequences until almost the closing pages of the book, attributing them to the wrong brother. When I looked back, I found that it is clearly identified who is dreaming in the opening pages, but I missed it- or perhaps the characters were not well enough established at that point? It was a rather strange experience being jolted to realize that the dream sequences were not what I thought they were, so late in the book, and considering what change that made to the way I had read and interpreted them. I had felt rather foolish, but then I looked at the title again, and realized that the “I” in the title is a bit misleading too- so perhaps the fault is not all mine- or was the ambiguity intentional? People who write books are invariably asked how they do it, by people who read them, in a similar way, for example, to how pilots might be asked ‘How do you fly a plane?’ by passengers who couldn’t imagine steering several tonnes of metal through the sky at 30,000 feet. Although there is a consistent, if complicated, logic to the flying of planes, I’m not sure there is a definitive one with regards to writing books. Creative processes, in whatever genre, are by their own nature constantly evolving and redefining their own boundaries. 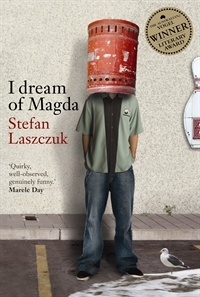 I decided to remain acutely aware of the creative processes involved with writing the novel for my PhD, ‘I Dream of Magda’. I also made note of external inspirations and practical considerations I encountered along the way. This resulting exegesis is an attempt to explore the genesis and creative evolution of my novel. Specifically, it will address the various challenges and benefits involved in writing the novel to a predetermined form, which, in this case, was the musical form ‘sonata’, adapted for literary expression. In the end, it may not be any more helpful in addressing a general question on how to write a book, but it should go a long way to explaining how the initial idea for this book, in particular, took off and eventually flew at 70,000 words. Very interesting reading- especially in light of my own response to the book. The completed, published book stands perfectly well and confidently on its own two feet, but I found it fascinating to read the author’s reflections on the book that it could have been, and the changes that he made to it along the way. Read because: I had heard about it- and was puzzled by the title. Is it THAT Magda?